Friendship is one of the most precious relationships and celebrating Friendship Day with your lovely pals is the celebration of this wonderful association. 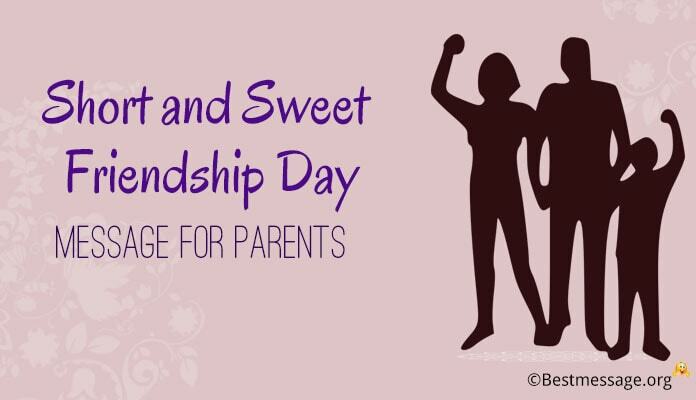 Every year first Sunday in the month of August is celebrated as Friendship Day all across the world. 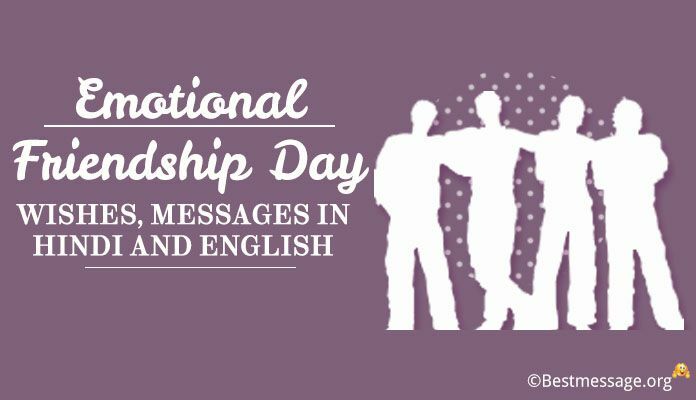 Emotional Friendship Day messages for friends, wife, husband, girlfriend, crush are the best way to express your feelings weaved with scent of friendship. 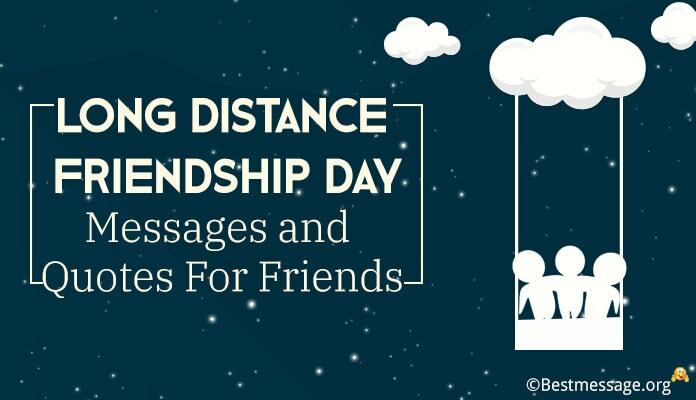 Share good emotional friendship status messages on Friendship Day on Whatsapp and Facebook with your friends. 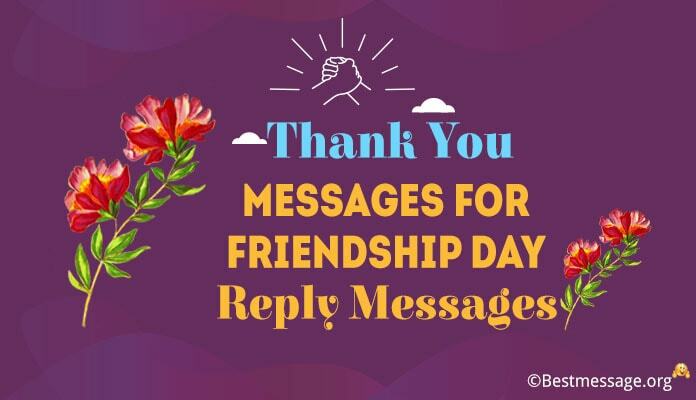 Given below is a collection of Happy Friendship Messages 2018. 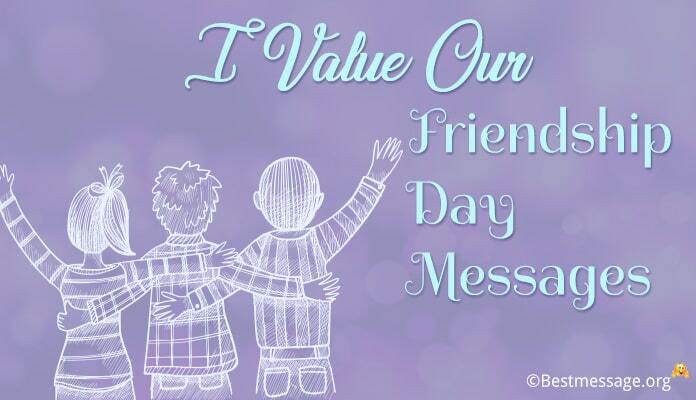 Best of Emotional Friendship greeting message for best friends in Hindi and English. 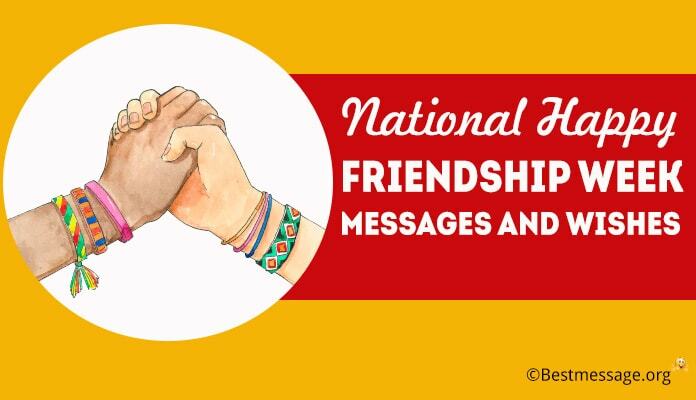 With these emotional friendship messages, make it a memorable occasion for your pals. 1. Yaara teri dosti hi hai mera sahara….. Yaara tera saath hi hai meri zindagi ki Roshni….. Yaara tu mere saath hai toh har din hai khushnuma aur har shaam hai Suhani….. Warm wishes on Friendship Day to you. 2. Tujhe bhulkar kahan jaunga mein…… Tujhse hi hai meri har saans aur meri har Khushi, tujhse hi hai mera har din aur meri har shaam….. Tere saath ke bina, mera Jeevan hai suna aur veeran…. 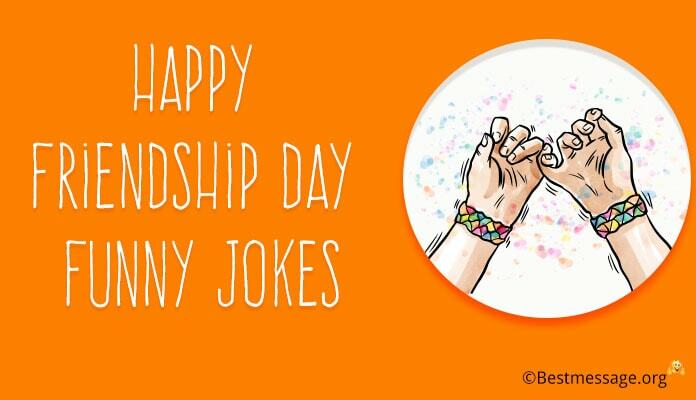 Happy Friendship Day to you. 3. Bhagwan ne diya mujhe aisa dost jo meri hansi ki wajah bhi hai aur meri hansi bhi…. Jo saath deta hai mera har gham mein aur Khushi mein…. Jo rang bharta hai indradhanush jaise mere har ek pal mein….. Friendship Day Mubarak ho aise mere dost ko. 4. Yehi tamanna hai ki teri meri yaari ke kisne duniya sune aur sunaye….. Tere mere sang ki log misal dein…. Tere mere dosti ke ye rang kabhi naa fike padein….. Aye mere dost hum rahein ya na rahein, par humari dosti hamesha jeeti rahe. 5. It is not easy to find a real friend and if you have found one, never let him go…. Happy Friendship Day. 6. Friendship Day reminds us to not take our friends for granted but always care for them as they are the most precious gems. 7. Blessed are those whose lives are showered with colours of friendship…. Happy Friendship Day. 8. The one who has the magical power to make you smile in the worst times is your best friend. 9. If you keep me as your best friend, I promise to lock you in my heart, away from all the sorrows…. And I will throw the key in the sea so that no one can ever take you away from me…. Warm wishes on Friendship Day. 10. If you ask me that how long we shall be friends then I will say that we should stay friends till there is Sun shining in the sky, till there are seas on the Earth, till there is life around us…. A very Happy Friendship Day to you. 11. I no longer want your friendship because I NEED it everyday….. It is my habit, my strength, my reason for existence…. I can live without food but I cannot live without you because you are my life in true sense…. A very wonderful Friendship Day to my best friend. 12. Friendship grows stronger, deeper with passage of time because you cherish it everyday by putting your love, care, affection and time in it…. I am so fortunate to have a friend like you who has nourished our relationship with the best of efforts…. Happy Friendship Day my dear. 14. Life is uncertain and unexpected….. Many people walk into your life but only a few remain in it and only a couple of them become friends for life but these people are the most special and precious of all…. Best wishes on Friendship Day to one such special soul. 15. The best thing about friendship is that is it the most flexible relationship where your friend understands you in every situation and doesn’t expect anything from you in return other than your loyalty…. Wishing you a very Happy Friendship Day. 16. I am not love but I miss you…… I am not your family but I am concerned for you….. I am not your relative but I am always there with you….. I am not your colleague but I am there to help you….. I am your best friend and I feel the most for you….. Happy Friendship Day dear. 17. The one person who has touched my heart and soul, who has given me strength and hope, who has stood by me through the toughest times, who has loved me when everyone rejected me…. Is my best friend…. Warm wishes on Friendship Day to my confidant!! !